I don't know when I started loving pizza, but there's not really much of a pizza culture in Seattle, and I think the best pizza I ate before I left for college was probably Pizza Hut's stuffed crust pizza. Then when I moved to the East Coast and realized that you could get pizza by the slice, my relationship with pizza totally changed. It went from being a once-in-a-while treat to something that I could eat all the time. 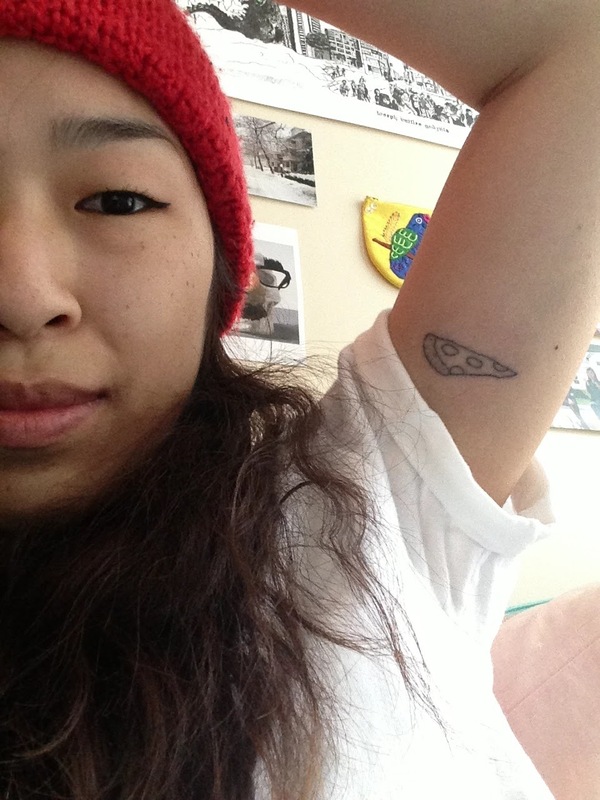 Pizza and I have been pretty inseparable since. 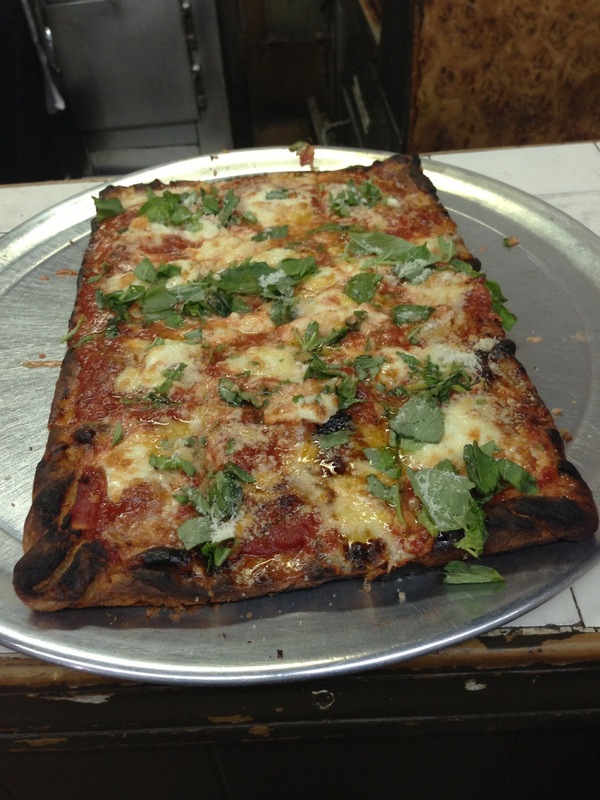 When I lived in Rome, I ate amazingly delicious pizza every day for breakfast and lunch, and by the time I moved to New York, I was a goner. Pizza was every where all the time. 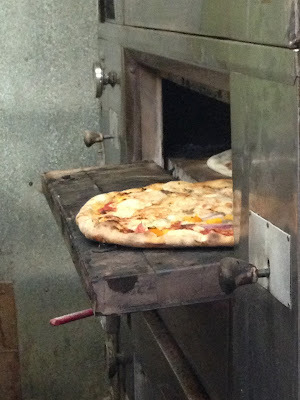 The thing is, all these different pizza experiences haven't made me like one kind of pizza more than another--good pizza, bad pizza, cold pizza, Neapolitan pizza, Sicilian pizza, fast food pizza, pizza bagels...I love it all. It's that unbeatable combination of bread and cheese, and even when it's bad, it's good. You just can't lose. But then I went to Di Fara's Pizza for the first time. 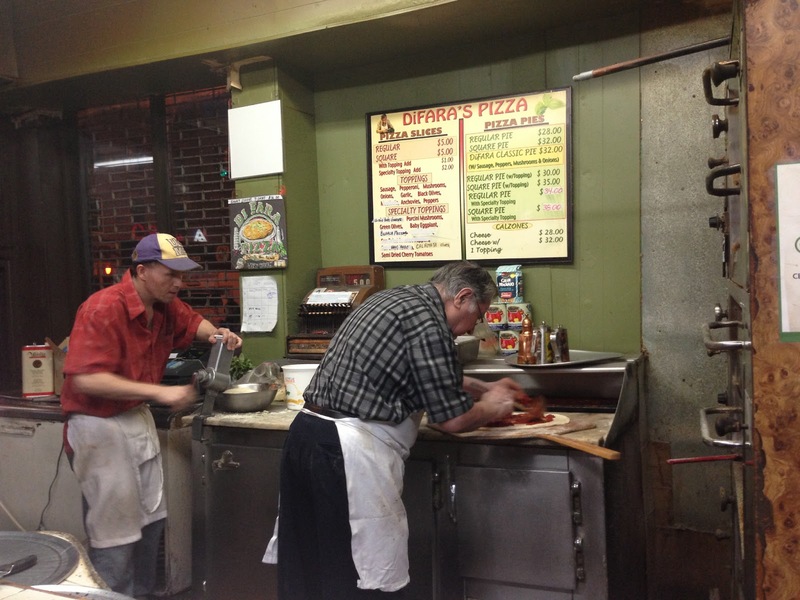 And while I don't think it was the BEST pizza, I can safely say that it was my favorite pizza that I've ever had. 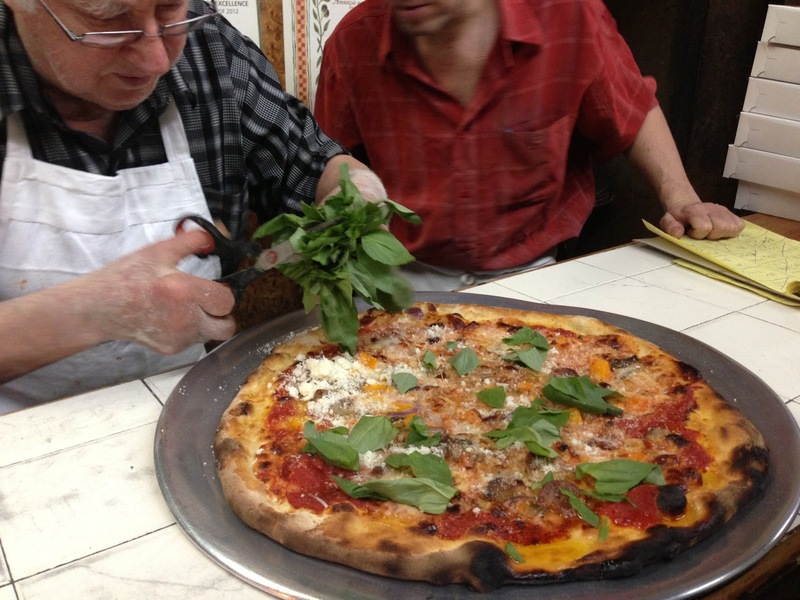 Maybe it was the puddles of oozing, gooey, milky buffalo mozzarella. Or that greasy drippiness the extra pour of olive oil creates. Or perhaps the way that the tangy-sweetness of the tomato sauce plays so well with the bunches of fresh, fragrant basil. Oh, or maybe it's that crispy, chewy, black and bubbly crust. And the generous extra sprinkling of Parmesan cheese, too. 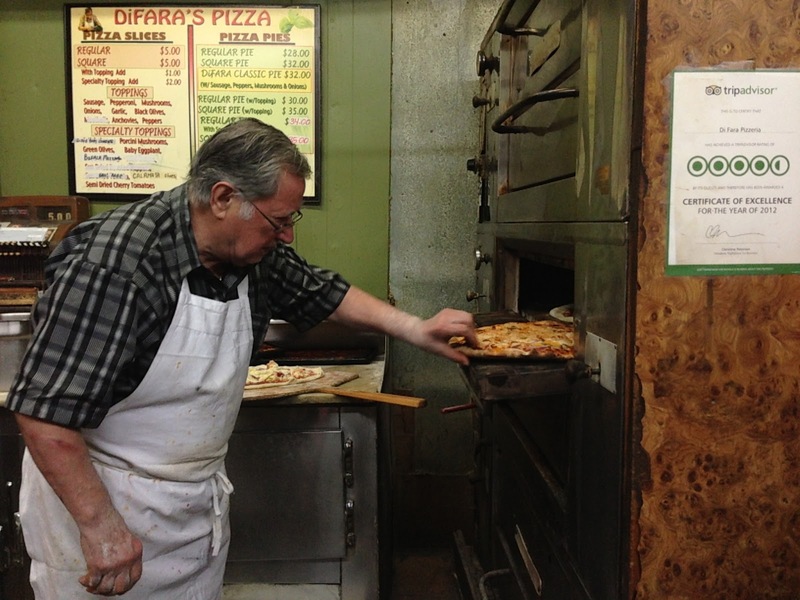 But all of that aside, what I really think makes Di Fara's pizza special is watching Dom Demarco make each and every pizza himself. It's a slow (and almost painful, depending on how hungry you are) process to watch, but it's totally mesmerizing. He makes each pizza as if there isn't a hoard of hungry customers crowding around the counter, as if it's the only one he's going to make all day. Lots of love and care, I think. 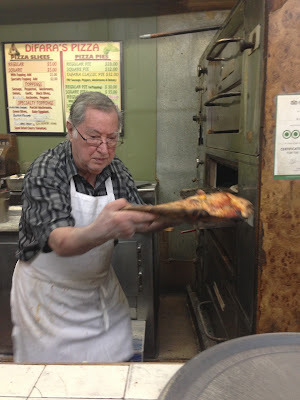 After 40 minutes of watching him stretch the dough, grate the cheese, and pooouuuur the olive oil, I knew I'd eating more than just a pizza--I'd be eating 40+ years of this guy's pride and hard work, a little piece of Brooklyn's history, the magical art of pizza making, and a lot of anxious anticipation and excitement. Look at this guy. Just going for the pizza with his bare hands. Seriously. Bare hands, hot pizza. What a guy. If this grosses you out, go away. I can't even remember if this was our pizza or someone else's. I just know that with every pie that hit the counter, everyone would descend on it like vultures, hoping it was theirs. 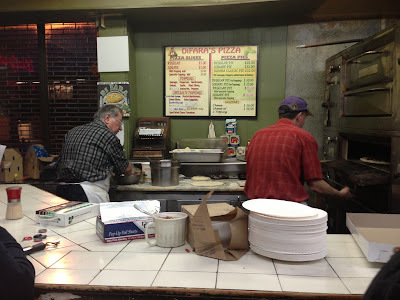 It's funny how calm the pizza-making area is compared to the chaos of the rest of the restaurant. If you can even call it that. It's small in there. I consider it nothing short of a pizza miracle that 9 of us all managed to get tables and three pizzas in under an hour. 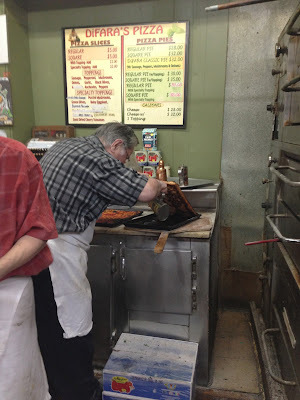 There he goes pouring some more olive oil at the bottom of the square pizza pan. And there's the square pizza in all of its charred, gooey, oily glory. I went for one of the coveted corner slices. After the first piece, the Sicilian slice was the winner in my book. 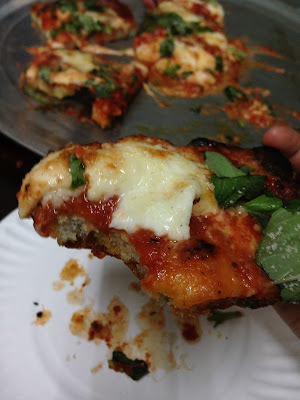 The crust was hefty yet airy, and it soaked up most of the oil instead of letting it slosh around on top of the cheese. But by slice 2.5, I thought maybe I liked the regular slice a little more. I'm not complaining about the oiliness, but there is a lot of it. And on the regular slice, it kind of drips off and you can either try to slurp it up, or let it spill all over your plate. With the square slice, you have no choice but to consume it, and once you've had a few slices too many, it really starts to hurt. 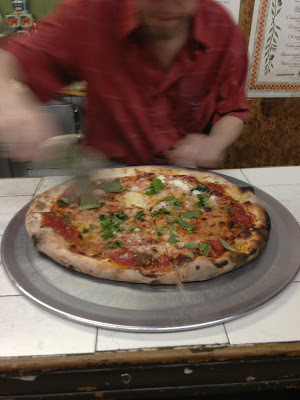 If I didn't know what it felt like to be waiting with baited breath for a pizza and a table, I might have stayed at Di Fara's a little longer. Let the pizza sink in, digest, close my eyes. But I know how hard it is to stand there, watching everyone chow down in pizza ecstasy, hoping that this next pizza that Dom is making so slowly will finally be yours. I honestly don't quite remember how we got home. It was a long, drowsy train ride, but one that was totally worth it. I think that all the effort that goes into getting to Di Fara and then having to wait for it, makes it that much more enjoyable and memorable. Besides, it was Danni's last night in Brooklyn, and I hadn't seen her in THREE YEARS. There really couldn't have been a better way to end her visit. Thanks crazy how he pick up the hot pizza!!! Pizza is pretty good! The staff is very nice.